Xerostomia, "dry mouth" is due to reduced or absent saliva production. It may affect a patient's quality of life and can lead to serious health problems! Learn about the signs, symptoms and managing xerostomia. Living with Xerostomia? Tried and true tips from cancer survivor Speech Pathologist, Marcy Maksail, for Saliva Substitutes, Mouth and Gum Health. Difficulty swallowing, dysphagia, may cause the sufferer to feel embarrassment eating and drinking around friends and family. This may lead to lack of participation during holiday celebrations. With some adjustments it is possible to make celebrations inclusive and enjoyable for all. We, at CMR, wish you and yours a very happy holiday season. 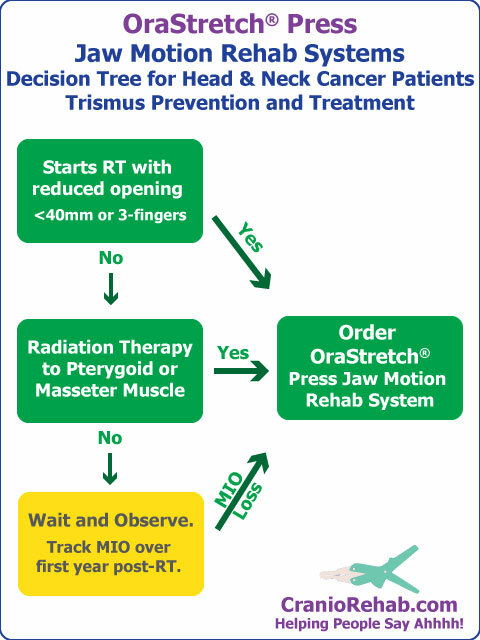 We have posted our first user-controlled webinar presentation about Head and Neck Cancer Rehabilitation Webinar, including information on trismus, xerostomia, the OraStretch press and TheraBite system. Learn about diagnosing trismus, when to order a jaw motion rehab system for prevention of trismus, how to order, treatment options for xerostomia and more. As a surgical nurse for many years a common patient complaint is “constipation,” an extremely common side effect of pain medications. Hopefully Popeye’s power will do the trick with lots of fiber, and most importantly: great taste! Spring’s freshest berries make this smoothie drink irresistible!! Treat yourself to this yummi-licious blend of mango, pineapple,banana and honey.